The ability to observe, diagnose, and subsequently improve the performance of business-critical applications is essential to ensuring a positive user experience and maintaining the highest levels of employee productivity and customer satisfaction. 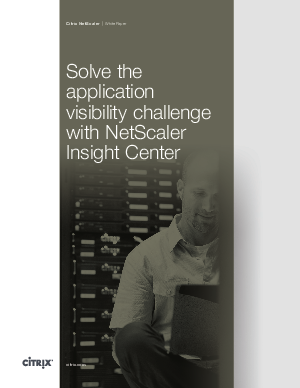 The challenge of establishing an effective application visibility and control function is only growing, as trends such as mobility, virtualization, and cloud computing fundamentally alter datacenter and application architectures. • Reduced total cost of ownership, based on having a low-cost, low-impact solution—particularly compared to traditional alternatives.